I have heard that knowledge is discerning differences or to that effect. For example, if all things are the same such that there is no differentiating qualities, we can't really speak of anything interesting (think about pitch-dark environment). I was taken by it when I heard it the first time, and now and then I think about it and it seems so true in all respects from a particle to complex ideas. Where/whom does this idea come from? "...he who says that he apprehends a figure, thereby means to indicate simply this, that he apprehends a determinate thing and the manner of its determination. This determination therefore does not pertain to the thing in regard to its being; on the contrary, it is its non-being. So since figure is nothing but determination, and determination is negation, figure can be nothing other than negation." The one who transformed Spinoza's subordinate clause into a motto was none other than Hegel. In the Science of Logic he presented the "determinate negation" as the essence of his own dialectical method, and believed that Spinoza did not appreciate his own discovery: "Spinoza’s top-down determination starts with a single category (in his case, divine substance) that is then progressively divided by the application of concepts—the model being Plato’s method of division in which a genus concept is divided into particular species by the presence or absence of some differentiating property. From Hegel’s point of view, however, this cannot capture individuals as other than parts of that greater whole—a metaphysical picture in relation to Spinoza he refers to as acosmism". According to Hegel, notions proceed from abstract to (determinately) negative, to be resolved in the concrete, the negation of negation, their superior form. See more in Melamed's Spinoza and German Idealism. An alternative is the French linguist Saussure's view that "in language there are only differences without positive terms... The entire mechanism of language, with which we shall be concerned later, is based on oppositions of this kind (e.g. between the word ‘father’ and ‘mother’) and on the phonic and conceptual differences that they imply". 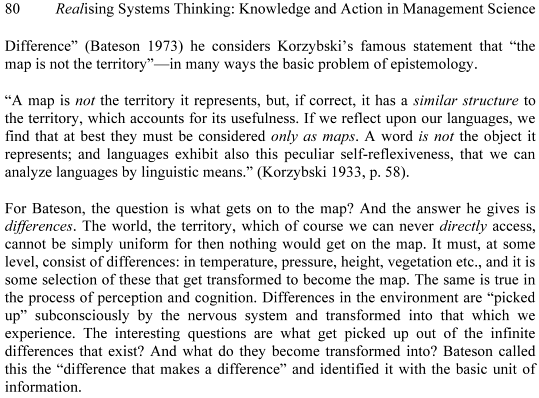 In other words, there is no intrinsic meaning to a concept as such, meaning is difference, concepts show themselves only in their differences from other concepts, "most precise characteristic is to be what the others are not". Derrida, an influential French continental philosopher, extended Saussure's view from language to philosophy, and came up with a neologism "différance", which fuses "difference" and "deferral". The word alludes to the indefinite deferral of "meaning beyond language", when meanings of words are invariably explained in terms of other words. "There is nothing outside the text", concludes Derrida, only the différance. The idea of knowing as differentiating goes back to dialectical arguments of ancient Greece. Several of Plato's dialogues are structured as Socrates and his companions trying to clarify a notion of something through "definition by division", by successively discarding what it is not (piety in Euthyphro, bravery in Laches, virtue in Meno, and knowledge itself in Theaetetus). Aristotle later formalized it in his theory of definitions in terms of genus (kind) and differentia (special characteristics). E.g. humans are differentiated from animals by their capacity to reason, etc. You may be looking for Bateson. When I read the quotation I was put in mind of Blaise Pascal's distinction between the 'spirit of geometry' and 'the spirit of finesse' in the Pensées (mid-17th century). http://www.gutenberg.org/files/18269/18269-h/18269-h.htm. ('The difference between the mathematical and the intuitive mind'.) The 'intuitive mind' does not work with the direct force of the mathematical mind but sees numerous, subtle and unsystematisable factors at work, differing from situation to situation, and is happy to note differences without drawing conclusions from them. There is probably no absolutely definitive answer to this question. I have simply urged some matters that are to the point. RICHARD DIEN WINFIELD, 'NEGATION AND TRUTH', The Review of Metaphysics, Vol. 64, No. 2 (DECEMBER 2010), 273-289 : 277. Wilhelm Windelband and Guy Oakes, 'History and Natural Science', History and Theory, Vol. 19, No. 2 (Feb., 1980), 165-168. Not the answer you're looking for? Browse other questions tagged epistemology philosophy-of-language hegel derrida dialectic or ask your own question. Can anything be described by describing what it is not?